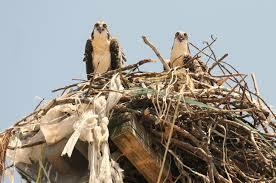 Osprey nests are large, built of sticks, and lined with bark, grass, algae. 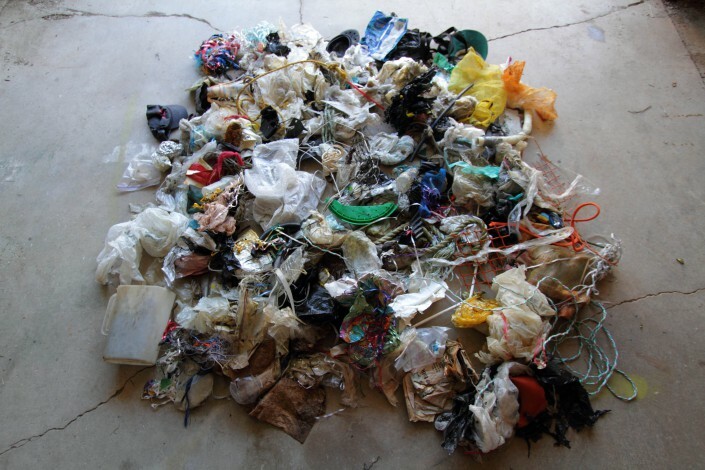 A sundry of shore line flotsam and jetsam are frequently found incorporated into their structures: plastic bags, pieces of plastic toys, fishing line and more. 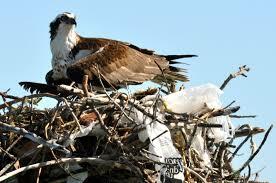 Ospreys have a strong desire to carry items back to their nest. They are beachcombers. Looking at an osprey nest, one can tell how the world has changed. Writing in Ospreys: A Natural and Unnatural History, Alan Poole lists the oddities found in osprey nests in the nineteenth century: a rag doll; a small doormat; a toy sailboat complete with sail; a feather duster; barrel staves and hoops; a boot-jack; 20 feet of hem rope; a blacking brush; a remnant from an oilskin rain slicker; and bleached-out bones from domestic animals like cattle and sheep. Now, in the twenty first century we find: rubber boots; bicycle tires; Hula Hoops; sections of television antennas; bikini tops; styrofoam cups and plastic hamburger containers. Here are some items used in osprey nest construction over the last couple of years.